Lenny is no phantom limb. While watching the mutant demon frozen in place, David imagines what life will be like once the Shadow King is obliterated and excised from his mind. He envisions a tingling sensation where Amahl Farouk used to take up space, and a sense of part of himself missing. David never really had a life apart from his mutant parasite, and is curious to experience it. But Lenny’s a being with its own power, and unlike a limb, it grows back when harmed, threatening to overtake his host completely, or at least kill David in the struggle. But Lenny’s also not a tumor, even though Syd’s analogy hits a little closer to home. Sure, they’re trying to rip out a deadly threat from David’s brain, and “put it in a bag,” as Syd informs Lenny, while the malevolent being stands there, sticky from the havoc visited upon it. Wet black tar is a fitting visual representation of Lenny’s state, and also a better analogy. This creature infused itself in David’s very psyche, living there so long it became part of the mental furniture. But you can’t pull up sticky tar without pulling out a good chunk of the material with which it bonded. You need to coax it off with some other material. Tumors, by contrast, don’t offer their hosts another way out. They just detonate, killing both malignancy and body. The Shadow King wants another path. And he gets it. The tricky thing about endings, to invert a certain ’90s pop song lyric, is that they always come from some other story’s beginning. The conclusion of “Chapter 8” functions as the launch pad for a new chapter of Oliver’s life, as well as Amahl Farouk. The two are now in tandem, and the open road awaits. After the long struggle to uncover and then root out David’s life-long nemesis, the mutant has simply jumped into a new body, a new adventure, and that sense of possibility immediately becomes a tale for another day (or season, as it were). And David’s conclusion here isn’t just a shock—it’s a full-on abduction, as the post-credits stinger shows him getting Zod-ed into a floating metal sphere. After all that trauma and suffering, years of lies and ignorance, David barely has an hour or so to soak in his newly free consciousness, and like that, he’s imprisoned once more. A life locked up is bad enough, but it might be worse to experience the fleeting promise of freedom, only to have it ripped away. That’s the tragedy of David Haller. He’s continually being told what he is, rather than being allowed to decide it for himself. Everyone around him has a version of him they see. He’s a world-breaker, a monster, a psycho, a God. At least Syd, with her love and empathy, just wants him to save himself—but even that implies he hasn’t quite gotten there yet, he’s not fully himself until this ordeal is over. Kerry and Cary hurt each other, and the expressions of pain from one to the other are affecting in a way that can only come from seeing two people be direct without guile or dissembling. But David is terrified of not being himself, made all the scarier from the possibility that such a person has never really existed. If most of us never really know who we are, than poor David must think he’s screwed. All of which is to say that “Chapter 8” is melancholy and reflective in a way season finales rarely are, especially ones about mutants fighting militarized international government agencies and mental demons simultaneously. The surprising reveal, of course, is the follow-up to last episode’s cliffhanger twist that the Interrogator is still alive. Clark, as we now know he’s called, is the protagonist of the first act, an unexpected and deeply humanistic way to kick off a finale waiting to save its main character from being devoured wholly by the Shadow King. Rather than any of that, we stay by Clark’s side throughout his recuperation from the fiery rescue operation that left 40 percent of his body covered in painful burn scars. It’s not just a means of showing this nemesis is still alive. It’s a way of demonstrating that he’s only a nemesis from a certain point of view. Clark is the hero of his own story—the one in which his husband and son help him weather this tragedy, and he comes back to work, ready to get revenge for the good men and women who died thanks to the assault on the pool area. Legion, right to the very end, shows that narratives are less important to it than the people than populate them. Even after giving over most of the first act to the man who wanted to keep David locked away, the rest of the episode has an unexpectedly languid tone. Director Michael Uppendahl doesn’t just give the last arc of this plot room to breathe, with lengthy debates between our team about the right thing to do with Clark, how to treat David, and providing halting recoveries following the climactic confrontation with the Shadow King. He makes a pulse-pounding and quite literally explosive showdown into a slow-motion, nearly languorous affair. It doesn’t feel like it, but in real time, everything from the moment Syd bursts into the room to save David until the shot of Oliver walking out of the building probably took under a minute to unfold. Again, this isn’t just a clever trick to play around with the speed of action. From the beginning, Legion has been in part about the unconstrained nature of time, and how it toys with our understanding of both space and reality. Events don’t just happen and then drop into the past, any more than memories are things that only pop up now and then. Memories are always with us, whether we’re conscious of them at a certain point or not. One second isn’t just a blink-and-you’ll-miss-it unit of time. Depending on what happens in that span, one second can last the rest of your life. Think about how fractured and jarring the first episode of Legion was, narratively. It jumped back and forward in time, from place to place, and reality to reality without any explanation of how or why we were in any one location. It was a reflection of David’s scattered mind, both tormented by Farouk and dampened and confused by drugs (and the eventual loss of them). As the season progressed, each episode changed structures and tones to match the evolution of David’s mind. The blips and sudden jolts lessened as he grew more clear-headed and aware of what was happening; the abrupt transitions into nightmares and surreal musical numbers increased as Lenny flexed her powers. And time seems to slow down as David enters a final confrontation with his longtime mental tenant, everything else falling away as he tries to burn out this toxic combination of phantom limb. tumor, and rancorous alter ego. This was best embodied by the almost gentle way in which David experienced the attack on Farouk. Whereas Oliver entered his own metaphorical-turned-literal ice cube, David enters a cube of excision, a cutting-away of the Shadow King not only from his physical brain, but his very memories. As Pink Floyd’s “Speak To Me/Breathe” fills the soundtrack, we watch as the moments of the Shadow King’s presence in David’s life are burned away, one by one, leaving not just David’s solitary mind in charge but a gap where Farouk’s presence used to be. It’s understandable why David came up with the phantom limb comparison; he’s being given back a life partially devoid of an infection that plagued him from almost the beginning. And yet, he’s curious to discover who’s life this will be. It’s certainly not the one he knows. But David, unfortunately, has time now to discover which memories of the Shadow King have remained with him in the wake of Farouk’s escape in Oliver’s body, thanks to his capture by some mysterious entity. (Perhaps the “Equinox” mentioned by Division Three?) “We’re gonna need to work together, now,” he told Clark, and the Division Three agent immediately agreed. The enemy of my enemy is my extremely cautious ally. Syd was able to see Lenny in the White Room, thanks to their brief psychic connection, but it’s unclear just how much help that will be—it was still David sensing the direction Oliver/Lenny were going at the end. But this group has a new mission, now. David was powerful enough to possibly broker a cease-fire with an international group tasked with their elimination; if the humans want it, that war is over. Legion has given its exhausted heroes a respite, only to immediately spirit it away. This season was entrancing, puzzling, exhausting, and energizing in equal measure. That’s storytelling that doesn’t need any mutant abilities—it’s exerting a singular power all its own. Hang in there, David—we all want to come find you, as soon as possible. Amy must’ve been tired; it seems like she slept through that entire conflagration, unless she just has very good noise-canceling headphones. Music cues: Along with the Pink Floyd, we had Oliver singing Tony Benett’s “If I Ruled The World,” and the credits tune, “Children Of The Revolution,” by T. Rex. I get why the Shadow King stuck with Kerry’s body, but I was kind of hoping to see it pass through everyone en route to escape. Still, happy Melanie survived her psychic gunshot. 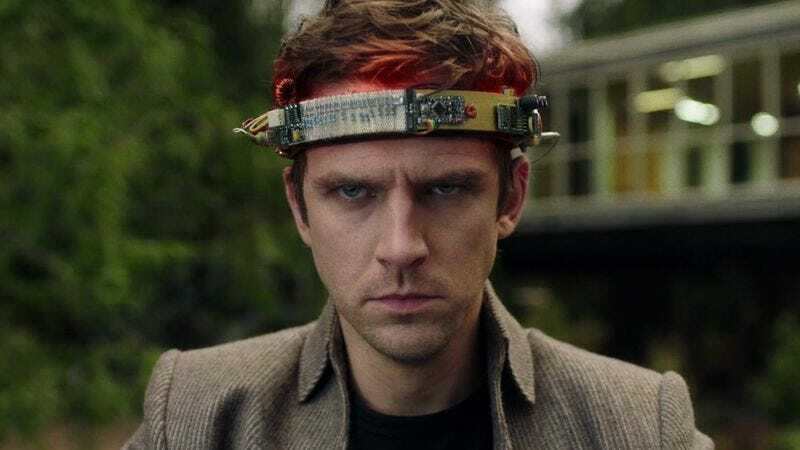 Definitely check out our coverage of Noah Hawley and Dan Stevens talking about the finale and plans for season two. 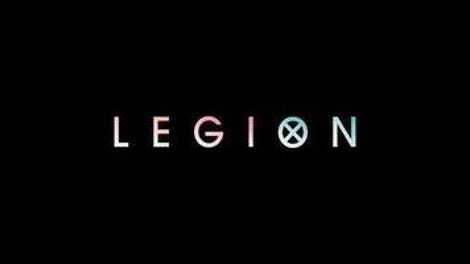 I can’t tell you what a treat it’s been reviewing this inaugural season of Legion with all of you. Reading your comments here and on Twitter, and discovering the many pleasures of this strange and fascinating show, has been delightful. With luck, I’ll see you all back here next year for season two.